For most of us, a favorite camping meal is that fresh-catch being cooked up on the grill. 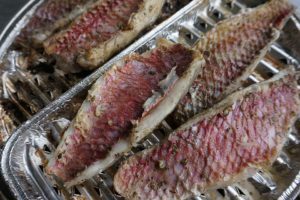 Cooking fish without drying it out can be tricky, however, so we found some tips to help make yours the best you’ve had so far. Start with a very clean cooking grate on your grill. It will keep the fish from sticking. Preheat the grill on high and scrub it well with a stiff grill brush to get any remnants of food off the grill rack. Be sure to make sure you don’t leave any grill brush bristles behind that could become embedded in your food. Double check that. You’d be surprised how often it happens and can result in a painful trip to the emergency room when someone swallows pieces of the grill brush. Coat the fish well with oil or fat of any kind. You might even try mayo which will work well with the fish and its flavor will dissipate during the coooking process. You can also brush the grill with oil as well. This will help with the notorious problem of fish sticking to the grill grates. You will be grilling your fish on high heat, usually 8 minutes per inch of of thickness will be just right. Lower the lid (except for tuna) and cook the fish on the first side for 2/3 the time and flip for the final 1/3. Try not to turn it more often than this. You’ll get those gorgeous grill marks and a nice, crispy outside crust. Some people swear by fish spatulas for turning the fish. They are thin, with an angled blade and the tines are spaced wide apart. You can use two and approach the fish from both sides to easily lift the fish when ready. Seasoning can be as simple as salt, pepper, and some lemon. You might try dill for a fresh burst on this summer treat and make your own tartar sauce with mayo and dill relish. It’s a nice change from the standard. Fish is a healthy, delicious alternative for a tasty camping dinner. We hope you enjoy yours with good friends and family.